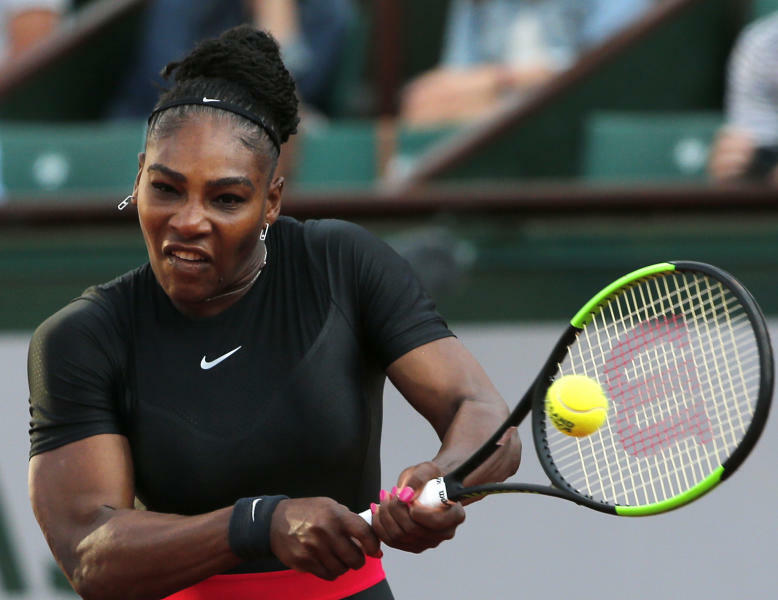 NEW YORK (AP) — Serena Williams isn't worried about a dress code at the French Open. Her skin-tight black catsuit won't be welcome, but Williams had already put it back in the closet. She no longer needs a full-length outfit for health reasons and won't be wearing it again at the U.S. Open. Besides, for someone with Williams' style, going back to the same look would be a fashion faux pas. "When it comes to fashion, you don't want to be a repeat offender," she said Saturday. "One must respect the game and the place," Bernard Giudicelli said. "I think that obviously the Grand Slams have a right to do what they want to do," she said. "I feel like if and when, or if they know that some things are for health reasons, then there's no way that they wouldn't be OK with it. So I think it's fine." Williams wasn't just trying to make a fashion statement when she wore the outfit that she called her "Wakanda-inspired catsuit," referring to the fictional nation in the film "Black Panther." Though Williams shrugged it off, the French Open decision drew strong reaction from inside and outside of tennis. Billie Jean King wrote on Twitter that "the policing of women's bodies must end" while former U.S. star Andy Roddick tweeted that the decision was "so dumb and shortsighted it hurts," adding that "Sometimes it'd be nice if the sport got out of its own way." The catsuit controversy briefly overshadowed Williams' return to the final Grand Slam tournament of the season. Serena is the No. 17 seed and could play sister Venus in the third round. Top-ranked Simona Halep could be an opponent in the fourth round. Serena said she hadn't even looked at what opponents she could face as she hopes to win a 24th Grand Slam singles title, and seventh in New York. She's one of the favorites, despite some struggles since returning to tour. "That I would be the favorite at this point, almost a year after having a baby, is quite interesting," Williams said. "You know, I don't know my draw, but I feel like I'm going to have to play — if I want to be the best, I'm going to have to start beating these people anyway." She hasn't lately, losing three of her last four matches, dating to her loss to Angelique Kerber in the Wimbledon final. But at 36, Williams remains respected by her rivals, whatever her results. "She's one of the greatest players to ever play, if not the best of our generation," defending champion Sloane Stephens said. "I'm sure she's ready. I'm sure she'll have another great tournament." But there is one thing that hasn't changed. Williams wants to win as badly as before. "If anything, I have more fire in my belly," she said. "It's very hard to describe. It's very difficult to describe. I thought after having a child I would be more relaxed. I think I've said this before, but I'm not."